Champagney has been in training for almost five months now. At times the pace seems almost glacial – as it generally is, with remedial horses. Her owner has been utterly fabulous. Between injuries and the simple reality of working with a profoundly anxious horse, there have been many setbacks. Nonetheless, we have seen significant progress. The horse who used to be tense 100% of the time is now a happy, relaxed creature with occasional moments of tension. If I can put it this way, she used to be 8/10 anxious permanently, regularly spiking to 10/10 especially during work. Now she’s a 0/10 most of the time, spiking to maybe 3/10 once or twice a ride. Very rarely having a moment that shoots her back up to maybe 7/10. She stands at the mounting block. She has a concept of relaxed connection and right bend. She’ll even jump fillers, if you take your time and remember to breathe down. New objects beside the arena that elicit a hairy eyeball from Savanna or Zorro often don’t even get a response from Champagne. She ties up and hangs out contentedly beside the stable to be tacked up, and cheekily grabs mouthfuls of grass while standing in the wash bay after work. But up until Thursday, there was one topic we just hadn’t been able to tackle, and it was the scary end of the arena. For the first two months I worked this horse on a 20m circle at C and even that was a bit much sometimes. I used a lead horse to get her around the whole arena and tried that for a while, but every session still involved fear, tension and escalating anxiety about it. So I went back to my 20m circle and grew it ever so slowly. Eventually we established a 40m rectangle that she was fine with, so we stayed there for months, just working on suppleness and connection. When she got hurt, I started lunging her on a circle at R, then a circle at C. Some days she took off and we had to back it up to B again, but most days she was relaxed and stretching over her back. When I got back on board this week, we first just worked on our 40m safe zone again, re-establishing basic facts that she’s had to re-learn over and over: no, I won’t hurt; no, obedience isn’t optional; no, I won’t make you do it. Then on Thursday, she just felt great. I was able to get shoulder-fore anytime she felt a little tense, which was rewarded with a tiny release in her loin every time. And eventually, we just did it. 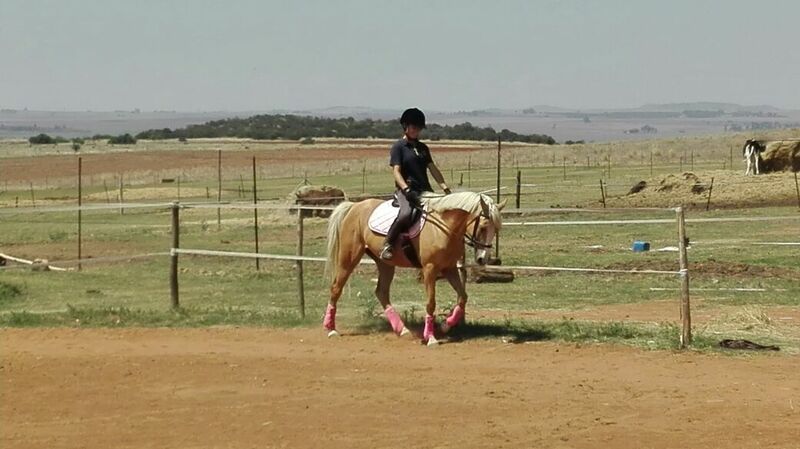 We went walk, trot and canter on the track. Relaxed and forward. She had one teensy spook, and her tension lasted about five seconds. The rest of the time, she just did it, no resistance, no tension. I guess you could say our progress has been glacial. But glaciers last. Our plans are for Pagney to do our yard dressage show in December, then to start going out and competing in January. I’d like to try take her to SANESA qualifiers since she’s supposed to become a SANESA pony, but I’ll need to see how she handles short warm-ups first. It’s already been a journey with this special, infuriating, generous, good-hearted drama queen, and there is a way to go yet. The other remedial beastie in training showed enormous progress, and then had something of a relapse. Savanna practically stopped running out at fences, but suddenly realised she could go forward and started going very forward over the jumps whether I liked it or not. (Hint: It’s not). Out of the frying pan and into the fire, rather, because to me – a trainer of SANESA kid ponies – “whoa” is never, ever optional. I need to know that I can get a halt, or at least walk, within seconds in absolutely every situation. Such is not the case with Savanna currently. She blew hard through my aids and I’ll be real honest, my seat and hands do not make as much of an impression on a bulky 16hh thoroughbred as they do on my usual honies. She is improving, but without bitting up, I’ve had to try and save our butts with a strong pulley rein quite often. Which has led to tension. Which has caused the running out to rear its ugly head again. I’m having to rethink how I approach this problem. I have to figure out a way to reinforce my whoa aid without escalating her tension; and it really has to work, or it will escalate mine, and that will escalate hers. That’s just a temporary fix to keep us from dying mid-course, though. In the meantime, we’re doing hundreds of transitions. Especially trot-halt, canter-trot, and canter-halt (obviously not cleanly, but within a few strides). Jump a fence, walk. Jump another fence, walk. She still feels like she can only make it over if she gallops. I always used to say I’d never train remedial horses again, but I’m so thankful that God’s grace rebuilt my nerve to the point where I’m not only doing it, I’m loving it. I always used to say I’d never train remedial horses again, but I’m so thankful that God’s grace rebuilt my nerve to the point where I’m not only doing it, I’m loving it. Glory to the King indeed, Firn. They’re both of them, very fine looking horsies.